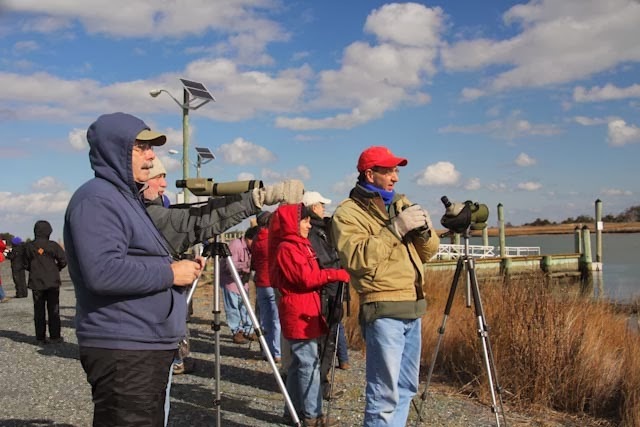 On January 11th, five of us representing Forsyth Audubon left the cold and set out for Belize. 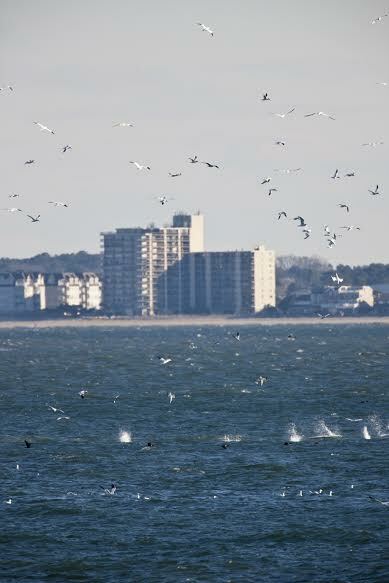 Jeremy Reiskind, Shelley Rutkin and Katherine Thorington had uneventful flights. Kitty Jensen and I: not so much. We sat in the Charlotte airport as US Air tried four times to get us on an airworthy plane. Finally, five and a half hours late we arrived in Belize City just in time to see the setting sun. Hearing that Crooked Tree Wildlife Sanctuary was under water, Jeremy had quickly found alternative accommodations at Black Orchid Resort. It proved to be an excellent choice – good food, responsive hosts and sitting along the Belize River. Sunday morning, we awoke early but refreshed. As I strolled to breakfast at dawn, a Lineated Woodpecker hammered on a nearby tree. Cousin of our Pileated, this was a pretty good bird to start my effort to catch up with my earlier arriving companions. 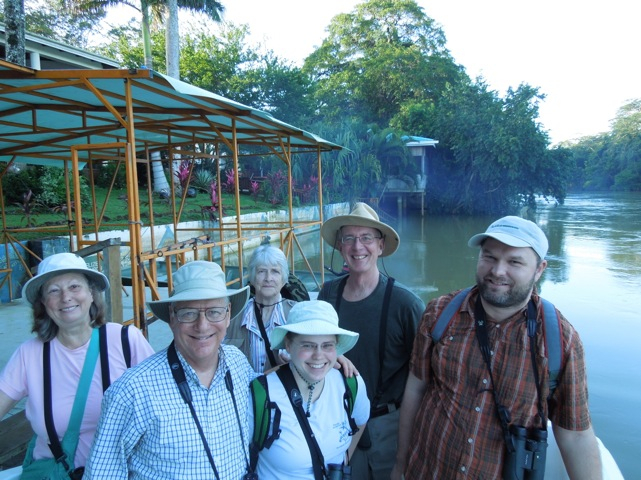 For this part of our trip, we were joined by Matt Jeffery of Audubon’s International Alliances Program, and by 7:15 AM all six of us were aboard a boat watching birds along the Belize River. Mangrove Swallows glided by us, while Red-lored Parrots and Montezuma Oropendolas crossed and re-crossed the water overhead. 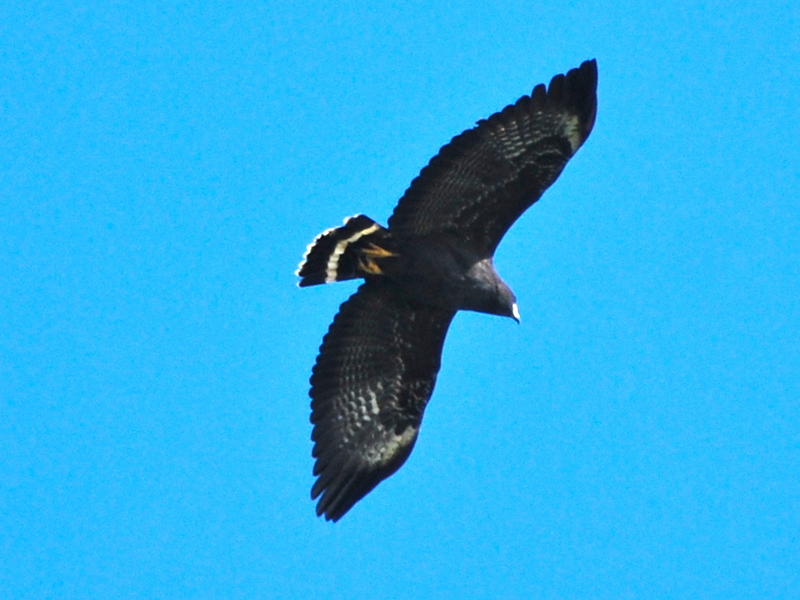 They soon were joined by a soaring Common Black-Hawk. 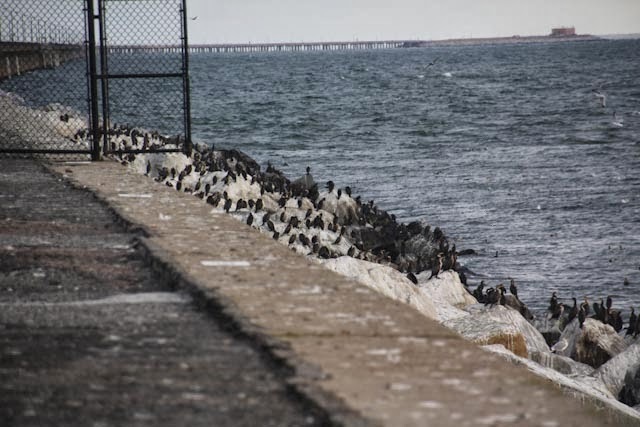 We kept our eyes on shore, too. 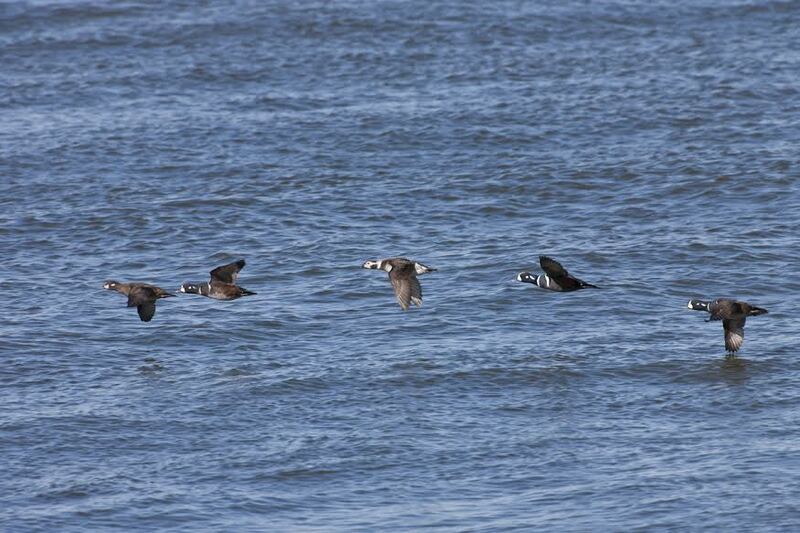 A Gray-necked Wood-Rail skulked along the shoreline, but other birds were more conspicuous. Noisy Groove-billed Anis hopped along some bushes, and we soaked in the bright orange and black of a pair of Black-cowled Orioles. 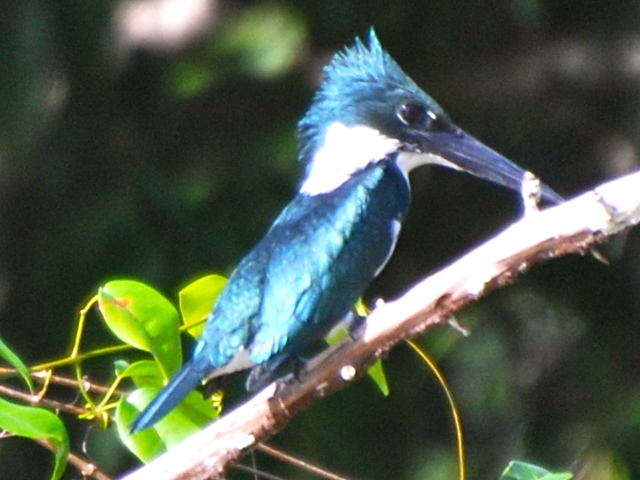 However, the highlight had to be a posing and resplendent Amazon Kingfisher. Our life lists were growing quickly, but we also saw numerous herons and egrets familiar to us from home. 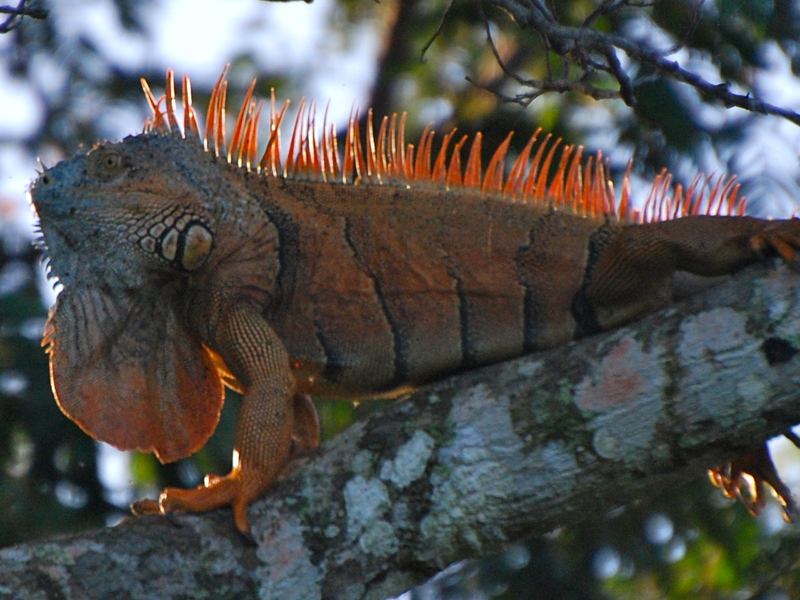 Male Green Iguanas, small fruit bats roosting under a bridge and a Morrelet’s Crocodile began our mammal and reptile lists. 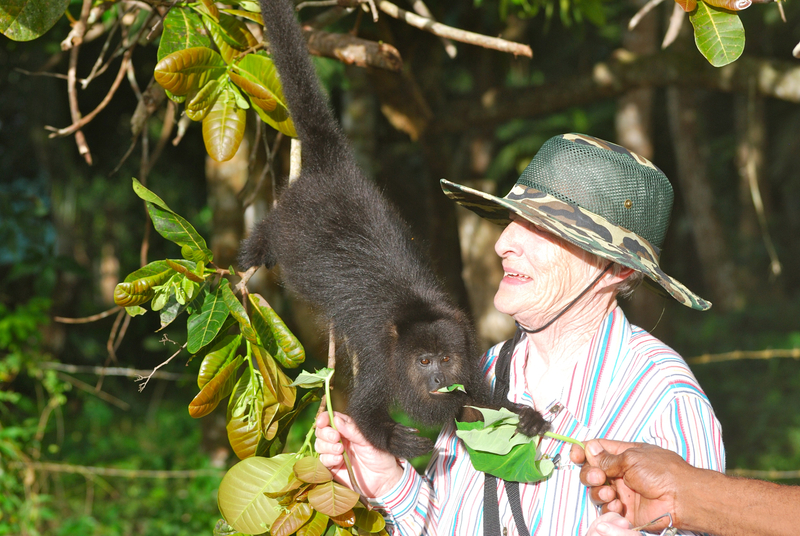 That afternoon, the Community Baboon Sanctuary proved a place to see both birds and Howler Monkeys, which are called baboons by the locals. What a sound they make in the forest when they get started. 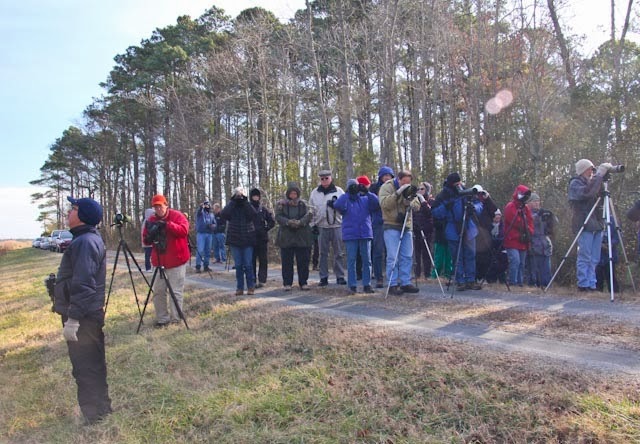 Russell, a local resident, guided us through the preserve, but for a while all we saw was birds. An Ivory-billed Woodpecker – oops, I mean Woodcreeper – climbed a tree trunk, a Squirrel Cuckoo bounced around above us, and Summer Tanagers cavorted near the trail. 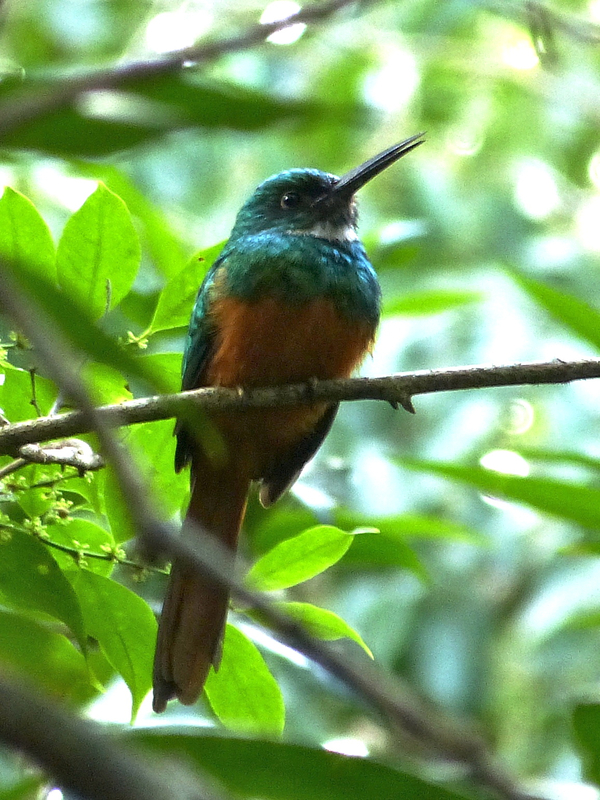 We also had been hearing a loud whistling call, and Russell tracked it down – a Rufous-tailed Jacamar. With some coaxing, the howlers finally showed up for great photo-ops. Early the next morning, we met up with several Belize Audubon staffers and Birds of Belize author Lee Jones for another boat ride. Our objective was a bird survey along the Burdon Canal near Belize City. 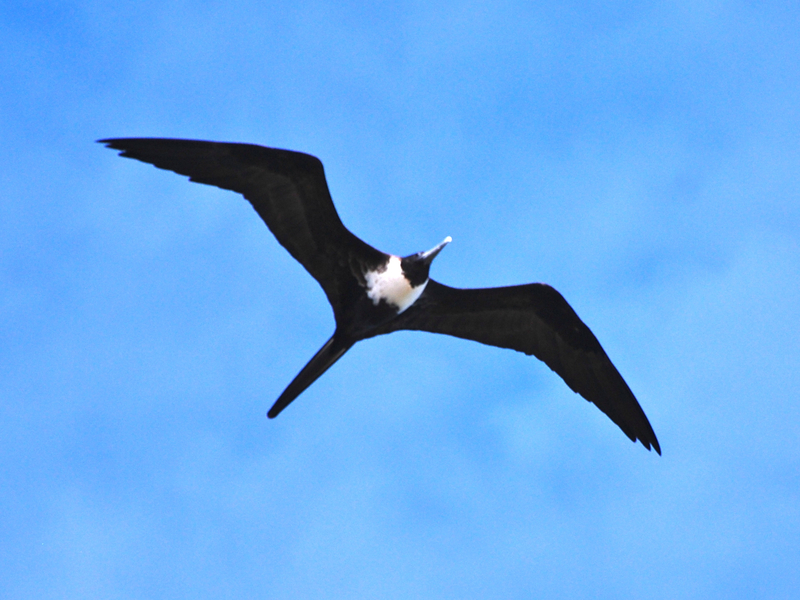 The frigatebirds in the sky were magnificent, as we set out. 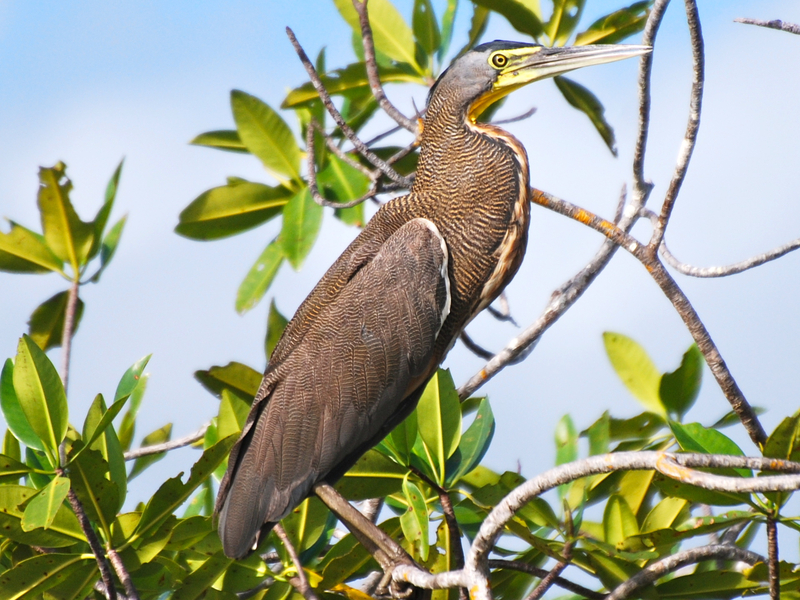 As on the previous day, most of the wading birds were familiar to us, but not so the large Bare-throated Tiger-Heron. A Ringed Kingfisher also was new to most of us. And, as we returned to the dock, Lee was able to end our two-day search for a Lesser Yellow-headed Vulture. After a waterside lunch, we scoured a nearby mangrove wetland for more birds, adding Rufous-necked Wood-Rail, a red-faced Mangrove Warbler (Yellow Warbler subspecies) and such other warblers as Magnolia, Redstart and Black-and-white. 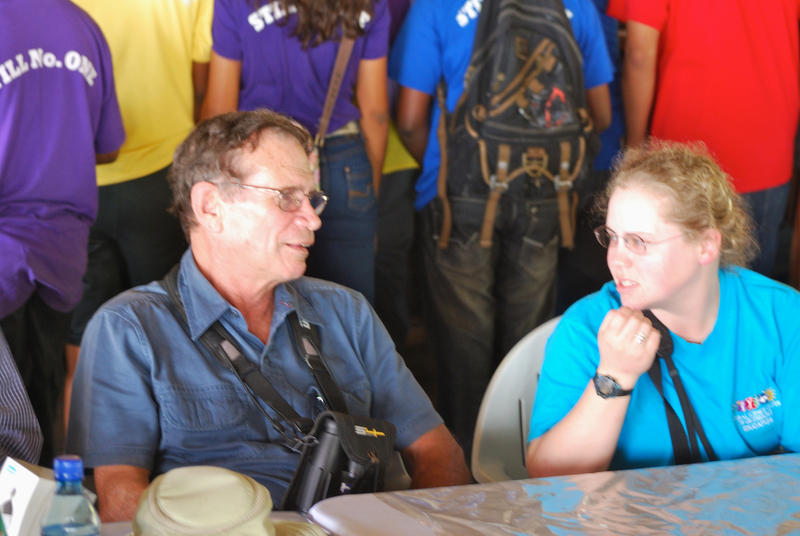 Then it was on to Belize Audubon to conduct eBird training, but more about that in a later post. 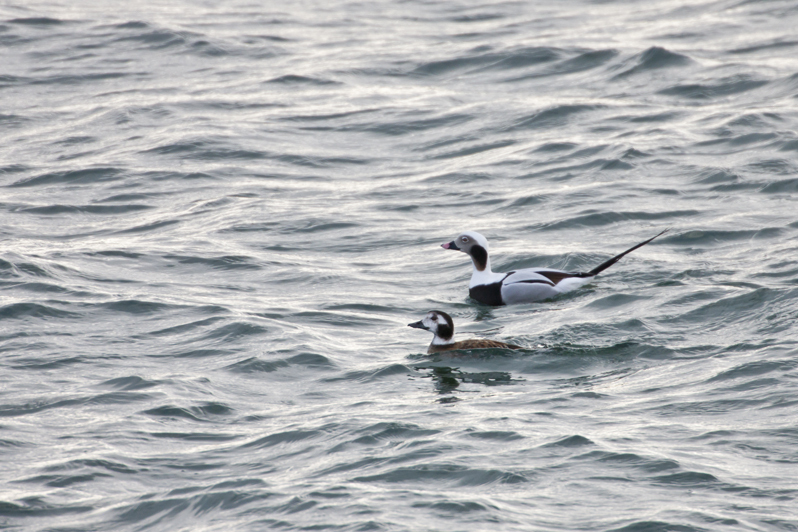 Also much thanks to Lee for sharing his knowledge of Belizean birds over both lunch and dinner. This is the first in a series of five posts.